I want to thank those who gathered on the steps of the capitol Monday morning for our counter protest. WE successfully changed the conversation! People are coming together and the coalition is growing, despite challenges. I want to thank those who participated. We learned that Senator Mike Johnston and Senator Owen Hill would be leading the Charter rally this past Thursday. By Friday, Stefanie Fuhr had created a sign up for protesters to register. Our goal was twenty people. Thanks to organizers across the state, like Don Perl, Jim Sickafoose, Betty Harris, Ed Augden, James Bailey, Peg Robertson and many others, who helped extend the invitation to thousands of people. 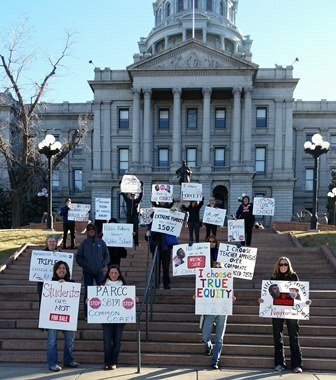 On Monday THIRTY people stood side by side on the street of the capitol holding signs; thank you Diane, Jen and Heidi. Connie drafted a press release and Patrick sent it out. And a week later the conversation that was intended to promote charters throughout the media circuit was instead talking about poverty! Well done. Please read the articles below as well as the comments that follow.I encourage you to keep this conversation going by exercising your VOICE. Share some of these great articles below and “comment” elsewhere. Photos from Monday’s protest can be found here. Colorado Public Radio is producing ongoing coverage of children in poverty, and we’re looking to find adults who grew up in poverty to share their experiences. I wasn’t crazy about the KDVR FOX news coverage either. Talking over the traffic made it appear as though I were yelling. The quote below is from the blog of a Voucher fan. His words were the best compliment! But when you see a news story interchange the general idea of school choice with Denver’s “School Choice” enrollment system and the state education department’s school choice support unit, and suggest that open enrollment allows families to access private schools, you begin to wonder if the protesters at the event wrote and produced the news story.The Fox 31 News story on the School Choice Week rally was painful to watch. The 1202 task force did not listen to parents, teachers, or students who SAID loud and clear on surveys, in public, you do not value state mandated tests. **** read the report *** that several task force members created/signed onto…this report is LEFT OUT of the 1202 final report. Email your legislator today, if you put in your zip code, it goes right to your legislator. Do this NOW, before the 1202 task force presents on Wednesday morning. The link also provides you with additional supporting documents and space to personalize with your own comments. Please share the link widely! Also, please mark your calendars for February 3 at 9:30 AM for a SPEAK lobby day at the Capitol. We will meet in the basement and will pair up people with experience lobbying with those who are new to the process. We will be done by 11 AM. If you are interested in testifying, Senate Education will likely hear testimony on February 5. Time TBD. 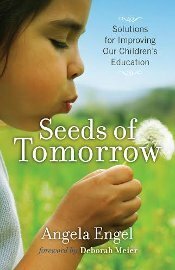 House Education will hear bills on February 16. One of the bills on the calendar for that day to reduce testing and return assessment decision making to our district is written by Cherry Creek parent and freshman Representative Jack Tate. We are hoping to have a large crowd or parents, educators and kids that day as there is no school. More info to follow shortly on these opportunities…Thanks, and please email with any questions!